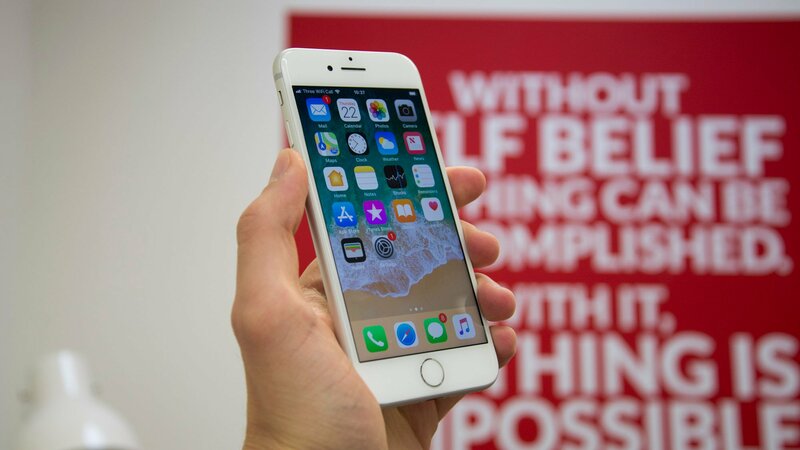 iPhone 8 review: A worthy upgrade from the iPhone 7? In September 2017, Apple unveiled not one but two new generations of iPhone. Of course, it was the iPhone X that grabbed the headlines, with its full-face screen. iPhone 8 shouldn’t be overlooked. It builds on the iPhone 7 with the new A11 Bionic chip, Qi wireless and fast-charging capabilities, an all-glass back, a True Tone HDR display, and better post-processing camera capabilities that result in better, clearer images. That adds up to more than a minor upgrade. So, if the iPhone X doesn’t appeal – is it worth upgrading to the iPhone 8? If you're unsure on which phone to get, read our comparison articles: iPhone 8 vs iPhone 8 Plus, iPhone 8 vs iPhone 7, and iPhone 8 vs Samsung Galaxy S8. The iPhone 8 looks very similar to the iPhone 7, and the 6S before it. It’s the standard iPhone design, with a 4.7in 750 x 1,334 resolution IPS display. Inside, however, the new A11 Bionic processor makes it the fastest iPhone ever made, and its 12-megapixel camera is slightly better than its predecessor’s too. Add in the adaptive display, wireless charging and all-glass design, and it’s a definite step up from the iPhone 7. However, at £669 SIM-free, it’s over £150 dearer than the previous model - and a lot more expensive than many Android rivals. That means it’s hard to recommend unless you’re really willing to pay a premium for the latest top-of-the-line handset. On Apple’s website, you’ll pay £699 for the standard 64GB iPhone 8. Shop around and you can find it for £669 at Carphone Warehouse – but that’s still over £150 more than the iPhone 7. There are some really great tariffs available, too. O2's bargain contract has 12GB of data with unlimited texts and minutes for just £32 a month and £160 upfront. That works out to £928 overall which is only £320 more than buying the handset itself. Want the iPhone 8 on a contract? Have a look at our dedicated deals articles from Mobiles.co.uk and Carphone Warehouse. If you’re open-minded about Android, there are many cheaper alternatives to choose from. 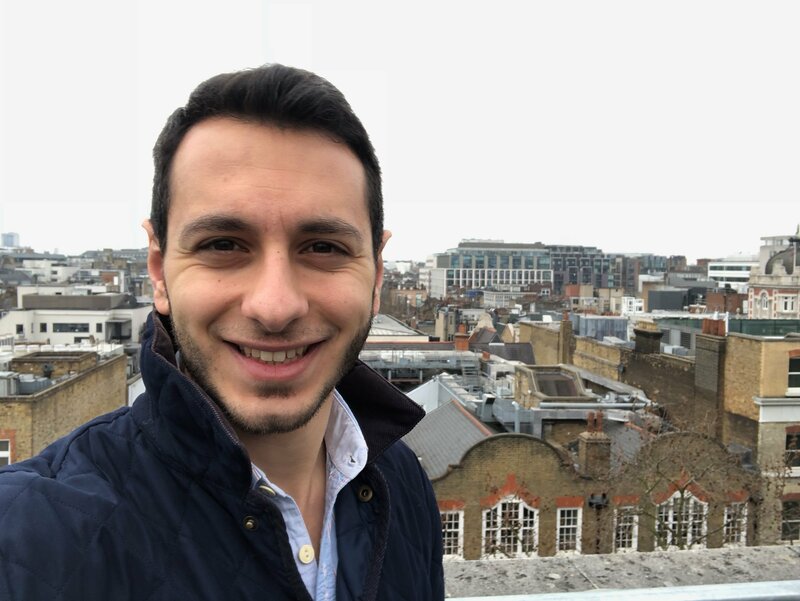 The Samsung Galaxy S8 can be had for around £500, while the all-new Galaxy S9 costs £739, the fully kitted out OnePlus 5T is around £510, and the Google Pixel 2, with its incredible camera, can be nabbed for £559. The iPhone 8 doesn’t look at all dissimilar from its predecessor, the iPhone 7. However, where that phone comes in five colours, the iPhone 8 is only available in three – silver, space grey and “gold” (which in reality looks distinctly pink). In an effort to improve sturdiness, the phone’s chassis has also been re-engineered, with an aluminium alloy casing, and a glass outer that’s reinforced by steel; Apple says this makes it "the most durable [glass] in a smartphone". While the glass rear looks classy, it picks up fingerprints and scuffs rather easily (just like the jet black iPhone 7). In less than a week of usage I noticed scratches appearing – even though I hadn’t dropped or mistreated it at all. If you want to keep your iPhone 8 pristine, you’ll need a case. Below the screen, the familiar circular Home button remains; it might have gone from the iPhone X, but here it still provides Touch ID and haptic feedback. On the audio front, Apple claims that the downward-firing stereo speakers on the iPhone 8 are 25% louder than those found on the iPhone 7. I certainly found them to be a tad louder, with no distortion. Unfortunately, there’s still no 3.5mm headphone jack. A set of Apple EarPods with a Lightning connector is included in the box, but if you want to use your own wired headphones, you’ll have to use the provided Lightning-to-3.5mm jack adaptor. One of the most significant new features of the iPhone 8 is wireless charging. And the good news is that it works with any Qi wireless charging pad – so if you bought that new Ikea desk with built-in wireless charging, you can use it to charge your iPhone 8. Apple has also introduced fast-charging capabilities that top up the phone to 50% charge in just 30 minutes. Finally, just like the iPhone 7, the iPhone 8 is IP67-certified, which means it’s moderately waterproof. It should be able to withstand being submerged at a depth of one metre for up to half an hour. The iPhone 8 uses the exact same 4.7in Retina HD (750 x 1334) resolution IPS display as its iPhone 7 counterpart, with the same 16:9 aspect ratio. There’s a lot to be said for keeping things consistent, but with many Android competitors moving to 18:9 displays, the shape is starting to look a bit dated. Still, it’s a great screen. In my display tests, it reached an excellent peak brightness of 577cd/m2, with a bold contrast ratio of 1,697:1. 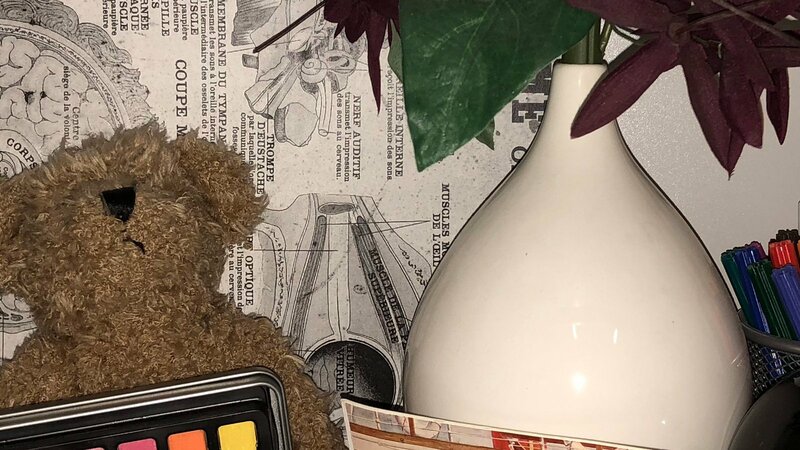 Colours are vivid, too – and thanks to the arrival of Apple’s “True Tone” technology (as found on the iPad Pro range), pictures and text should look cleaner and more readable even under adverse ambient lighting conditions. The iPhone 8 also supports HDR10 and Dolby Vision – technologies that are becoming increasingly popular on Amazon Video and Netflix, to give streamed movies extra tonal depth. The iPhone 8 is powered by Apple's own A11 Bionic chip, which the company has proudly described as the world’s most powerful smartphone chip. It’s a six-core design, divided into two low-performance and four high-performance cores. 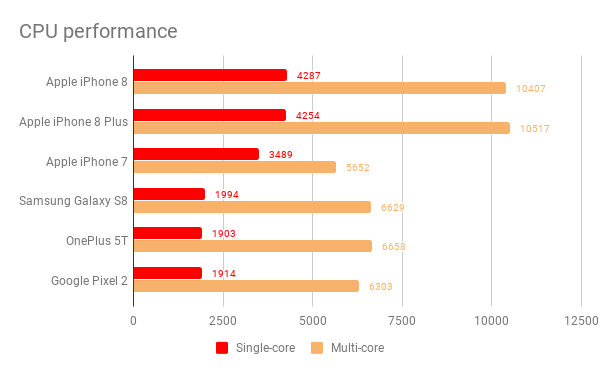 Even the regular cores are 25% faster than the previous A10 chip, while the others are up to 75% faster. Its performance speaks for itself: it’s by far the fastest smartphone I’ve ever tested (leaving aside the iPhone 8 Plus, which uses the same internals). The same can be said for the iPhone 8’s gaming performance. 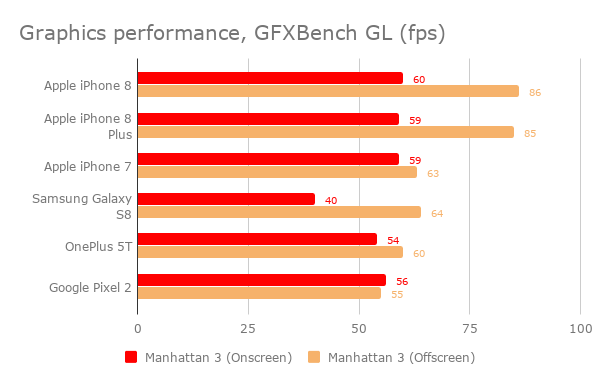 A score of over 60fps in GFXBench indicates that the iPhone 8 will power through anything you throw at it, from simple games such as Candy Crush and Temple Run, to the most complex titles such as Asphalt 8: Airborne. My only slight concern is that Apple has opted to include only 2GB of RAM. Granted, iOS is more memory-efficient than Android, but 2GB is still on the low side for heavy-multi-taskers, or those who like having multiple tabs open on Google Chrome. If that’s a real issue for you, you might consider the larger iPhone 8 Plus, which gets 3GB. Disappointingly, the iPhone 8’s 1,821mAh battery lasted just 9hrs 35mins in the Expert Reviews video benchmark – a rather poor score for a flagship phone. By comparison, its predecessor, the iPhone 7 managed a much more respectable 13hrs 2mins, even though its 1,960mAh battery was only slightly larger. At launch, Apple made a big deal of the iPhone 8’s photographic capabilities – and I’ve found its claims are wholly justified. 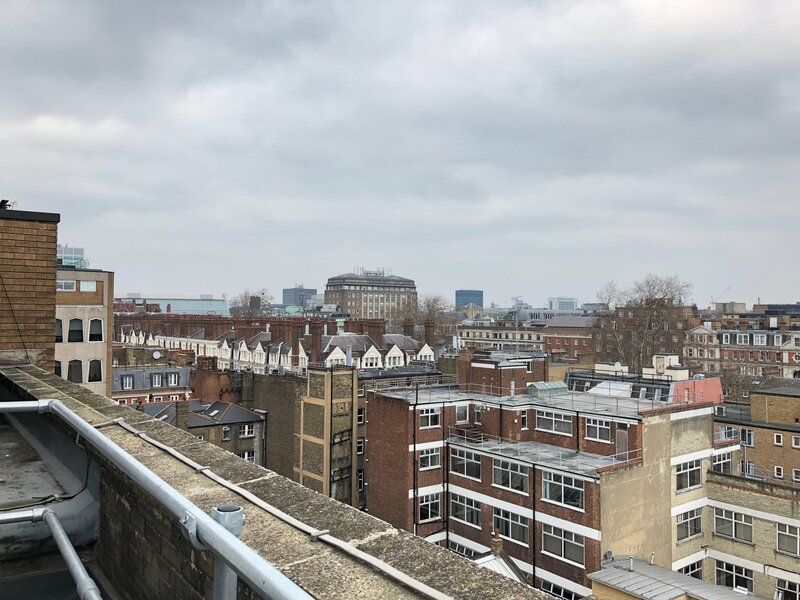 The rear-facing 12-megapixel f/1.8 sensor captures plenty of detail, reproduces an accurate colour tone across the image and correctly works out when to use HDR. Even in low-light conditions, the camera manages to pick up plenty of detail and suppress image noise to a minimum. 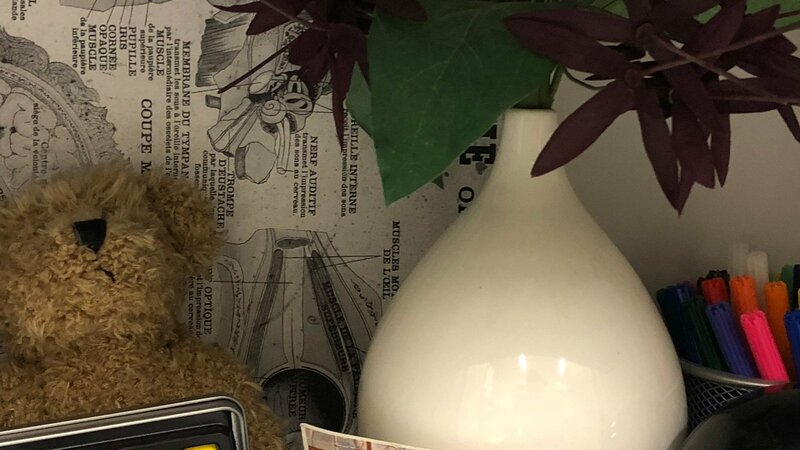 It’s not completely gone: in the image below, for example, there’s a bit of blurring around the coloured pens, and around the vase. But it doesn’t ruin the picture. And once you whack on the flash, image noise is completely eradicated. The iPhone 8 might not quite match the post-processing capabilities of the Google Pixel 2, but it’s definitely up there with the very best camera phones. On the front, Apple has stuck to a single 7-megapixel f/2.2 sensor, which means there isn’t that much detail on selfies. The OnePlus 5T (for example) manages to capture a lot more detail, and more vibrant colours too. There are real advantages, though. The iPhone 8 is faster than the iPhone 7, with wireless and fast-charging capabilities and a slightly better camera, not to mention the subtly slicker design. In short, it’s an impressive phone that perhaps hasn’t had the recognition it deserves. The problem is the price. The iPhone 7 is already such a great handset that it’s hard to justify paying £150 more for its successor. 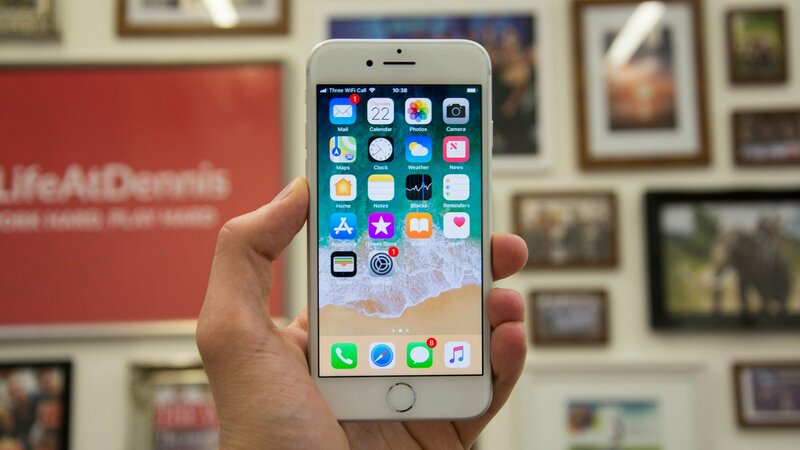 And of course, if you’re not bound to iOS, you can save even more by opting for an Android alternative – which makes the iPhone 8 a tough sell.